Forest fires are not uncommon and every major reserve forest will have had a fire at some time of the year. It simply couldn't compete with the hundred other headlines. But someone did sit up and take note. 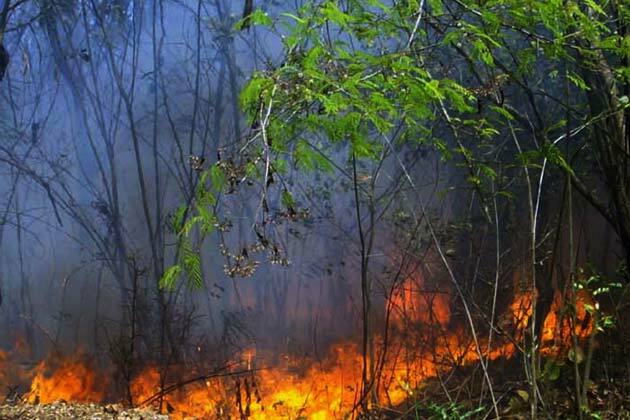 It was finally discovered today that the fire was man-made and not because of the intense summer heat as the Karnataka forest Minister and his cronies would have us believe. Forests in India, much like any where else in the world have been shrinking. However unlike other forests, our the trees in our forests retain enough moisture to retard a spontaneous forest fire. A growing appetite for timber and homes have fueled a need to axe down incredible areas of forests every second. While most the 'civilized' world are making provisions for replacing what they take away from nature, a country like India is still learning how to resolve a conflict of interests. Any visitor to the north east (Shillong et al) will be astonished to see how entire hill sides have been carved for charcoal and rock. I went on my first guided trek across reserved forest and pristine valleys in the Nilgiris. While much of the hills are still covered with lush green forests so thick that you could easily lose all orientation we discovered so much of the hill-sides burnt down to shrubs and reduced to grass. Makes it easier for the humans to graze their cattle. The result is growing patches of barren landscape that contributes to global warming. Walking through a steep incline within a forest was easier than one of the barren patches because of loose rocks and soil that was no longer being held together by roots and trees. While we may not see or feel the immediate effects of our arson, by burning down forests that have been there longer than we have, we are pushing the larger mammals to a corner. And seeing how we are the top predators, fighting back is not an option they have. I shudder to think of a world where we wont have an elephant or a tiger left in the wild. Cliched as it sounds, humans have to learn to live in harmony, respecting boundaries and regarding animal and plant life just as themselves. A forest the size of Nagarhole could take several decades to get there, and given a chance where humans won't interfere, they will. The big question here is- Do we have it in ourselves to let nature take it's course?